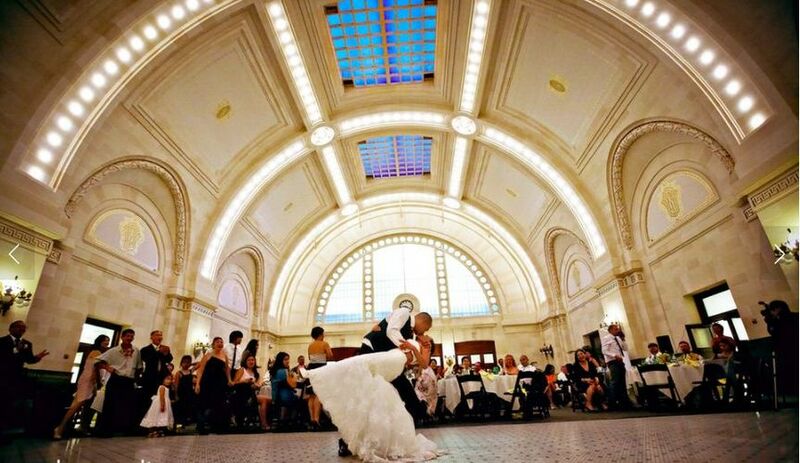 Joni Earl Great Hall at Union Station is an elegant venue in a government building for couples’ weddings in the greater Seattle, Washington area. This massive chamber will steal guests’ breath away with high arched ceilings and antique fixtures. Couples can find this building located moments from the Seattle Aquarium and Frye Art Museum. As many as 1,000 guests can join couples in celebrating their wedding day at Joni Earl Great Hall at Union Station. This historic government building is full of light and grace and, when couples celebrate their wedding within its walls, full of love. The incredible arched ceilings stretch down the entire length of the chamber, meeting at skylights at the top for added natural light. There are also windows at the end of the hall on the semi-circular wall. In addition to natural light, lights along the walls-turned-ceiling add to the ambiance and romance of a couple’s wedding. The floors are a smooth tile and antique light fixtures line the walls. Couples will find green tiles adorned with gold along the lower part of the walls. These nicely complement the greenery of potted plants throughout the space. Couples will find plenty of room in the Joni Earl Great Hall at Union Station for their event. Couples are invited to celebrate their reception within the walls of this historic wedding venue. There is plenty of space for dinner, dancing, and many photo opportunities await. The venue has central air and heating to keep everyone comfortable during the reception, no matter the time of year. Couples will find plenty of time for setup and cleanup of their wedding reception. They are invited to find outside vendors to provide bar and catering services, decor, and other necessary items for their wedding celebration. As vendors arrive, couples can prepare in the elegant getting ready room that features full-length mirrors and marble accents. This stunning Seattle landmark was built in 1910. The incredible vaulted ceilings bear 460 twinkling lights to illuminate a couple’s wedding day. The hall itself is 11,000 square feet, and Union Station can be found in the center of Pioneer Square.